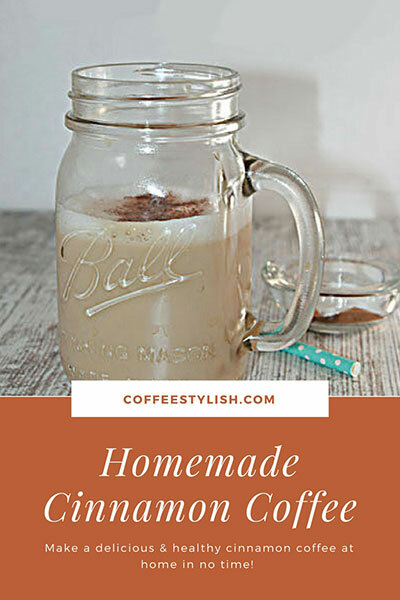 How to Make Cinnamon Coffee – The Easy Way! Turn your regular cup of coffee into a tasteful one, with one simple ingredient – a pinch of cinnamon. Besides the fact it’s yummy, cinnamon coffee can also have some positive health effects. With its antibacterial, antifungal and antioxidant properties, cinnamon has been shown to be useful for everything, from preventing heart disease to diabetes. When making your own cinnamon coffee at home, you can use ground cinnamon or cinnamon syrup. If you want to add cinnamon not just for the taste, but also for its health benefits, use ground cinnamon. How much cinnamon per cup of coffee?! Try not to use too much. A rich pinch or 1/4 of a teaspoon per cup is perfect. Brew coffee and set aside. Whisk together cinnamon, brown sugar and milk, and heat until steaming. Slowly add this mixture to your coffee while stirring. Optional: garnish with whipped cream and a pinch of cinnamon. Pull out one double espresso shot or brew 1 espresso pod. Add 2 tbsp cinnamon syrup. Pour 6 oz cold milk into the steam pitcher and foam the milk. Slowly add milk to your coffee. Add sugar to taste. Brew coffee, add 2 tbsp cinnamon syrup and stir. Heat the milk on the stove or in the microwave and slowly add to your coffee while stirring. Add sugar to taste. You can also infuse the milk with cinnamon sticks and use it as a creamer. To infuse milk, heat 2 cups milk with 1 cinnamon stick in a medium saucepan over medium heat, just until steaming. Remove from heat, cover pan and let cinnamon stick steep in milk for 1 hour. Strain. You can refrigerate it for up to 3 days. Reheat gently before using. I used cinnamon in almost everything I eat, and some drinks. I alway make my coffee with cinnamon. I don’t use sugar, there is no need, the cinnamon balances that need. I do used coconut or cashew milk, usually with raw sugar in it. The problem with your recipe is that cinnamon does not dissolve. You can’t just mix cinnamon grounds in any liquid, hot or cold. They rise to the top and you have to stir every time you sip. Instead I put them or a cinnamon stick (though it doesn’t usually add as much flavor, but I keep experimenting) or, grounds or a stick in whatever mechanism I used to make coffee, with the coffee before brewing. If grounds don’t filter well, it might defeat the purpose, as in a French press. But still better than simply adding grounds to already made coffee. Currently I’m using a drip maker. I add the grounds or a stick before brewing. Sometimes on the bottom of the grounds, sometimes, mixed in, sometimes on top. Experimentation. When I use grounds in a drip maker, I run simple hot water through the machine every so often to make sure the grounds don’t clog the machine. Thanks for reading! Enjoy, and yum. Hi Marla, thank you so much for your feedback. Correct, the cinnamon doesn’t dissolve completely. I don’t mind but you are right, some might not like this. Adding cinnamon to coffee grounds before you brew is also a good way to make cinnamon coffee. I used this method before and it works really well. Thank you so much for your suggestion! Hey there! I’m Savannah, creator and author of Keep Celebrating, my own blog. I just wanted to let you know and send you a short note. Also, I just wanted to say that I love your minimalistic design for the site. It’d be cool if we could work together sometime. Oh awesome thanks! I love your site here! Maybe we can do a collab sometime soon? Fall to me it the perfect coffee-inventing/creating time. Feel free to email me at ………… . I hope we can talk soon! Thank you! I’ve been looking for a simple single-serving cinnamon coffee recipe for hours. This is short, to the point, and with great info. Love it.